For the first time in two decades, the University of Nevada, Las Vegas campus is buzzing- and I mean buzzing! Excitement lights up the beautiful Vegas skyline as the Runnin’ Rebels kick off the 2012-2013 college basketball season. Loaded with talent (and high expectations), the Rebels basketball team hasn’t had a preseason ranking like this since the 90s; the kids are calling it Atlanta or Bust (The final four will be played in Atlanta this year). For many, this is just the start to an another roller coaster college basketball season but for Las Vegas, its something more. The University of Nevada, Las Vegas is a university searching for an identity. UNLV, home of nearly 28,000 students, is treated much like a gloried high school as the majority of the part-time population come and go to class without sniffing anything the campus has to offer outside the classroom. The university lacks a campus feel as less than 1,500 students live in the dorms annually and the football stadium is nearly 25 minutes away. The university is starving for campus culture and a true college environment. A few years back a friend of mine started the Rebel Nation, the first true student section dedicated to the involvement of the student population at sporting events. Although Rebel Nation was successful, the sports teams never fully took off and the group didn’t grow to its full potential. But Rebel Nation did do something very important for UNLV as it set the foundation for true student involvement. The Rebel basketball team began to become more competitive under Coach Lon Kruger and attendance at the games grew. Just a few years later, Coach Kruger left the Rebels and the team was searching for an identity. Insert Coach Dave Rice, former Runnin’ Rebel and the reason the hype is back at UNLV. With Rice (and a handful of college transfers from Kruger), the Rebels brought back the RUN and unleashed a masterful style of basketball that college basketball fans crave. The new (yet old) Runnin’ Rebel style of play was an absolute hit (as Kruger offense was very methodical and boring to most fans). 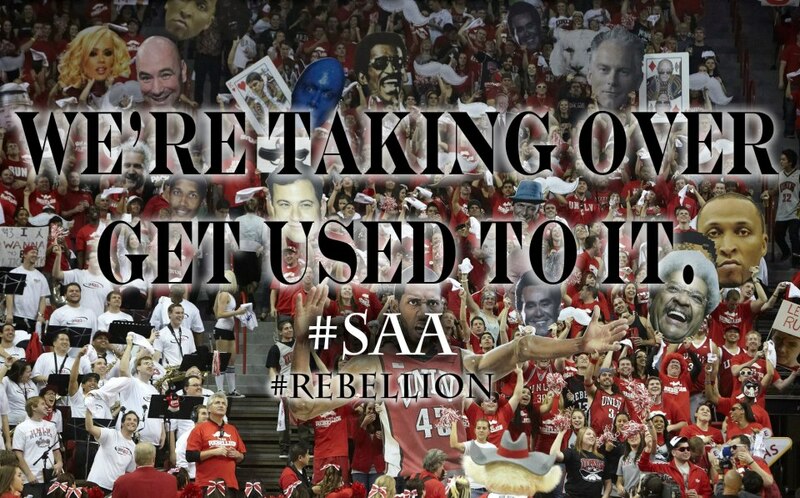 A second coming of the Rebel Nation grew and gained steam; the Rebellion was born and brought a swagger to the UNLV student section that most had never seen or experienced before. The Thomas & Mack Center was rocking each and every week for the Rebel Games. The Rebels were upsetting top opponents (like North Carolina- I was at that game and rushed the court! It was unreal). Basketball tickets, once easy to come by, were being sold for three and four times the face value. Rivalries grew, hatred developed, fan involvement grew and a university culture was beginning to form. Rice and his outstanding staff signed the best Rebel recruiting class in 20 years which included one top 10 player and four top 150 prospects in addition to two of the nations top transfers. Freshman Anthony Bennett, Katin Reinhardt, Savon Goodman, Demetrius Morant, and DaQuan Cook join transfers Khem Birch and Roscoe Smith to give the Rebels a chance at becoming a National powerhouse. The Runnin’ Rebels bring back a solid squad including star Mike Moser, senior leader Anthony Marshall, defensive standout Justin Hawkins, big man Carlos Lopez, top reserve Quintrell Thomas and, maybe the most exciting of the group, USC transfer Bryce Dejean- Jones. The Rebels look poised to not only make some noise in the Mountain West but at the National level as well. As the 19th ranked preseason team, it won’t be surprising if the Rebels crack the top 10 after Birch arrives in mid-December (oh I can’t wait because is he going to THRIVE in this offense). If this team can gain the national spotlight and bring UNLV back to the top of the college basketball standings, UNLV won’t be a university searching for its identity; it will be a basketball school with something to cheer for. Go Rebels.